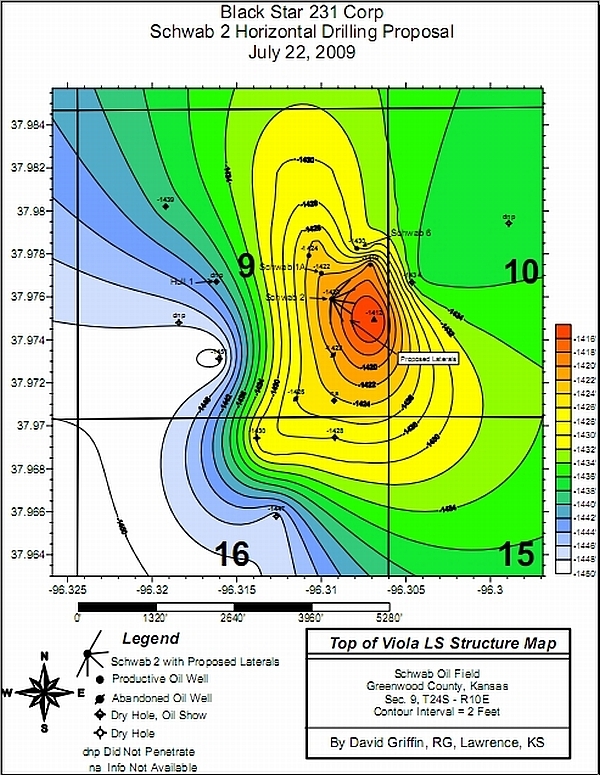 Contour map shows the location of the Schwab #2 well. 3-D cross section of the producing Viola showing the length and direction of horizontal laterals to be drilled. The Schwab #2 Horizontal Drilling Project involves re-completion of the Schwab #2 oil well producing from the Viola limestone formation. 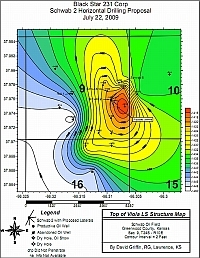 The Viola is penetrated approximately 2,840 feet below the earth's surface on the Schwab lease. 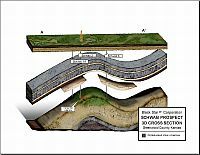 Horizontal drilling technology will be employed to reach sections of the Viola that have not yet been drained. The Schwab #2 well was drilled in 1976. 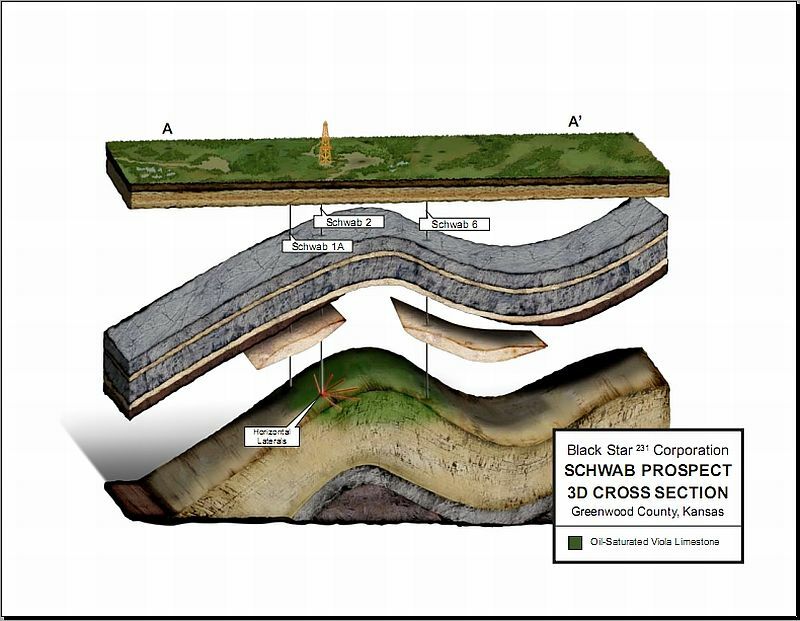 The practice in Greenwood County, Kansas was to not cement production casing all the way to surface. This was necessitated by not being able to lift cement to the surface in a single stage. Attempts to do so broke down the deeper formations, resulting in loss of the well. However, after 20 to 30 years, the casing often develop a leak in the un-cemented parts of the well. In 1996, the Schwab #2 well developed such a casing leak. At the time, oil was $10 per barrel and the cost of repairs was not economical. The well was shut in, and remains shut in today. The Schwab #2 produced roughly 40,000 barrels before the casing leak. The well's initial production was 30 bopd. At the time the well developed the casing leak in 1996, it was producing 3-4 bopd. Drilling horizontal laterals in older vertical wells began about 20 years ago in the Texas Austin Chalk formation. Old chalk wells that had produced 50,000 to 300,000 barrels of oil over their life, but had become old and tired producing around 5 bopd, were the first candidates for what was then a new technology. Horizontal drilling set off the biggest Texas drilling boom seen in 30 years, as these old 5 bopd wells were brought back producing more than their initial flush rates. The Schwab #2 horizontal project will install, and cement in place, a casing liner inside the existing 5 inch casing, clean the bottom of the well at the Viola formation, and rig up horizontal drilling equipment to drill six horizontal laterals extending 400 to 500 feet from the vertical well bore. Along each horizontal lateral we will pump acid under high pressure in several locations to stimulate the formation. The laterals will substantially increase the amount of total fluid from the well, a substantial portion of which is expected to be oil. It is reasonable to expect initial production of 30 bopd, but 50 bopd or more is possible. This project is slated to start in September. For more information about the project and whether participation is available, use the contact form on the website or email jim@blackstar231.com.